Donal Ryan has taken out the Guardian First Book Award 2013 with The Spinning Heart, a picture of rural life in post-crash Ireland. I haven’t read The Spinning Heart (which was long-listed for The Booker Prize) but I have read (and have reviewed here on Stillnotfussed) two of the other short-listed titles, We Need New Names by NoViolet Bulawayo and Burial Rites by Hannah Kent, both of which were wonderful. Follow the link to find out how the judges went about making their decision based on the question: “Would I ever want to read anything else by this author?http://www.theguardian.com/books/booksblog/2013/nov/28/juding-guarding-first-book-award. Hannah Kent’s Burial Rites is also on the shortlist in the fiction category of the Victorian Premier’s Literary Awards in Australia. 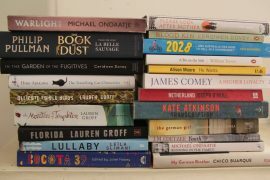 Also in contention is Questions of Travel by Michelle de Kretser (which won the Miles Franklin Award), Coal Creek by Alex Miller, Eyrie by Tim Winton, The Swan Book by Alexis Wright and The Narrow Road to the Deep North by Richard Flanagan. The quality of the shortlist highlights the current strong state of literature in Australia. Special congratulations to my friend and colleague Helen Trinca who is on the shortlist in the non-fiction category of the Premier’s Award with her biography of London-based Australian novelist Madeleine St John. She’s up against Gideon Haigh’s elegant assessment of Shane Warne and Germaine Greer writing about her patch of Queensland rainforest. Winners for all categories will be announced in January 2014.